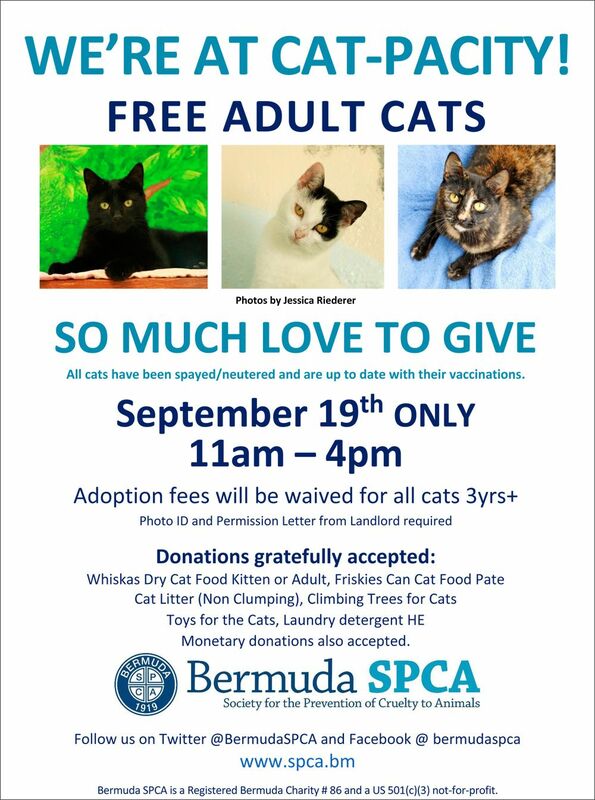 On Saturday September 19th, the Bermuda SPCA is having a cat adoption event, to encourage animal lovers to come and adopt the adult felines in the Shelter’s care. The Shelter said they are at “cat-pacity” with cats of all shapes, ages, colours and sizes, making it a great time to consider adding a furry feline companion to your household. “We’re hoping this promotion will encourage anyone who has been considering cat adoption to take the next step and make it reality,” says Bermuda SPCA Communication and Fundraising Manager Deborah Titterton Narraway. This Saturday only, from 11am – 4pm, the Bermuda SPCA will waive the adoption fees on all adult cats over the age of 3 years. All cats have been spayed/neutered and are current with vaccinations and worming. “There are several benefits to adopting a more mature pet over a kitten. They’re calmer and more settled, litter trained, fully grown and their personalities are already developed, so potential pet guardians are more fully aware of what they’re going to get”. “But the best reason is, adult cats deserve love too,” she says. Each year, the SPCA assists more than 500 felines across the Island by taking in unwanted kittens and cats and finding them forever homes, as well as providing a financial assistance program to encourage the public to spay and neuter their cats, lowering the incidents of unwanted kittens. The Shelter’s largest expense at this time of year is for the care of cats [feeding, cleaning, vaccinations, spay/neutering]. As a charity the Bermuda SPCA said they are extremely grateful for the support the community provides. There are several ways the community can help: adopt a cat; donate supplies: Whiskas Dry Cat Food Kitten or Adult, Friskies Can Cat Food Pate, Cat Litter [Non Clumping], Climbing Trees for Cats, Toys for the Cats, Laundry detergent HE; or make a monetary donations which can be done through the Shelter’s website www.spca.bm. The Bermuda Society for the Prevention of Cruelty to Animals [SPCA] was founded in 1919 and is a Bermuda Registered Charity No. 86 as well as a US 501© not-for-profit. Their objectives are to provide effective, lawful means for the prevention of cruelty to animals, promote the education of the general public on the care and wellbeing of all animals, encourage and promote kindness to animals. For more information visit www.SPCA.bm, email info@spca.bm or call 236-7333. I saw a few black kittens up the Tribe Road No 5 hill, on the left through a small alley, past South Shore going over to Ord Road the other day, when I was going for a run. they looked wild. Hopefully someone found them a gave them a home. Thank you for the heads up. We will notify BFAB, the organisation who cares for Bermuda’s feral cat population. Yes, please note – the cats the SPCA have to offer are NOT wild, feral cats! They are lovely tame cats who have been socialized and cared for by staff and volunteers. They make amazing pets. My rescues are the sweetest cats I’ve ever come across. What does it cost to adopt one of these fury friends? On September 19th there will be $0 cost to adopt a cat over 3yrs. The adoption fees are normally $50 for cats 3yrs+ and $100 for kittens under 3yrs. All cats/kittens are spayed/nuetered and a current with their vaccinations etc. We adopted 2 adult cats from the SPCA about 5 years ago and it has been a huge success. They are wonderful pets and a part of our family. If you can give a cat a home, please do so – you will get back in spades.